These are frequently used in my house and I always make sure that I keep a couple stored in the freezer door. 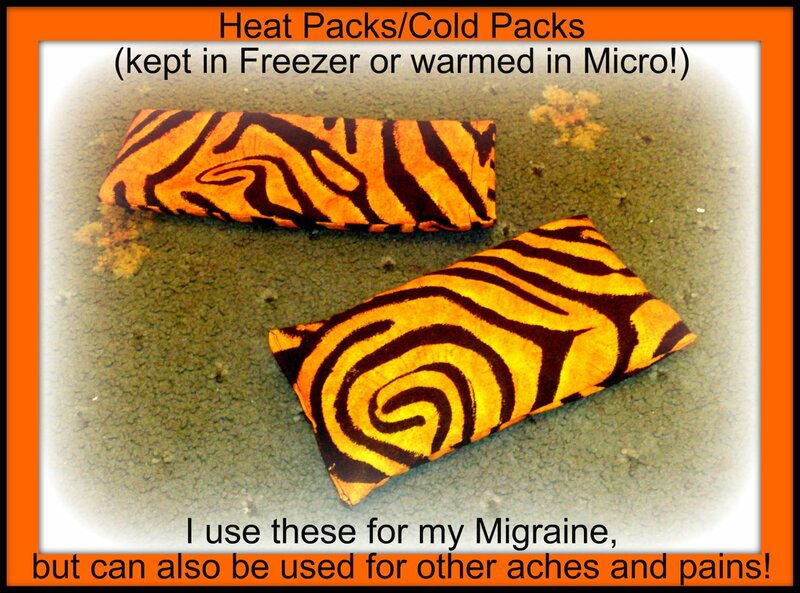 These hot/cold packs are great for aches and pains and can be either placed in the freezer for a cold pack, or in the microwave for a heat pack. I mainly use these as a freezer pack for when I have a migraine. I keep two there, so that I can alternate between them. They are also used as a cold pack for when the kids have a temperature or a bump on the leg. In our house they are used in the microwave to ease stomach cramps or any other aches. Everyone has a different preference, some people prefer a heat pack for migraine, you decide yourself how you want to use these packs. You can also make miniature versions to be used as ‘pocket warmers’. My son made a couple of these last year. He would heat them up in the microwave before he set off for school, and then place them into his coat pockets. Every now and again he would put his hands in his pockets for a warmth, very useful in the winter months! You can also make larger versions of these. I have never made any personally, but I have seen patterns online to make neck rice packs. These are long and can be draped over your neck or your limbs. I have even seen some made as a feet warmer to go in your bed. These are very simple to make, as I mentioned my 12 year old son even made some. All you need is some cotton fabric and a filler (either rice, wheat or barley), I personally always use plain uncooked rice. As an option you can add a fragrance such as lavender. Why not have a go at sewing one of the options that I have mentioned above.